Shipping a personal car is one thing, but shipping a commercial vehicle is another. Of course, the process is pretty much the same, but the stakes are higher with commercial vehicles. If you have a business that depends on vehicles in everyday work, you want them to be shipped on time and 100% safely. If something goes wrong, your business can be interrupted. You can lose money due to your auto shipping company’s mistakes. To avoid that situation, look for commercial transport services providers with a good reputation and years in business. It is better to trust your business to a reliable company instead of looking for the lowest price. 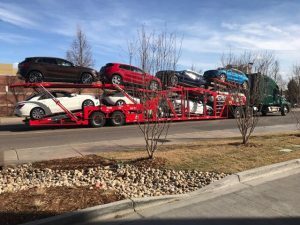 Omaha Car Transport has been providing auto shipping services for over ten years. If you are looking for professional and hassle-free Omaha Auto Transport, we are the right company for you. We provide commercial transport services for all kinds of vehicles. No matter if you need to ship a single cargo van or several buses, our team will be happy to do it for you. We will make sure your shipping goes smoothly and every step of the process is taken care of. We ship all over the 50 states, including Alaska and Hawaii. Also, we can ship your truck, trailer, van, bus or any other kind of vehicle, commercial or personal. Omaha Car Transport will also be happy to assist your business with other shipping services. We can help you with Corporate Relocation, Dealer Car Transport or Auction Car Shipping. When shopping around for Omaha Auto Shipping quotes, contact us for a free estimate. You can request your car shipping quote online or over the phone. Call our office for all the info on our Commercial Transport Services and ship safely and securely! We are looking forward to shipping for you.